Fenner Precision’s Senior Development Chemist, Dr Joe Hallett, attended the Innovations in Rubber Design Conference on the 7th of December. 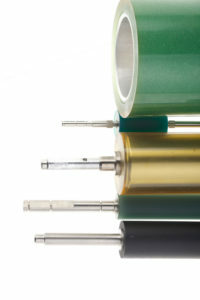 Fenner Precision presented a poster which focused on Electropghotographic Digital Technology and the requirements for Transfer Rollers that provide enhanced print quality. The event was organised by IOM Communications on behalf of the Rubber in Engineering Group of the Institute of Materials, Minerals and Mining. To incorporate new materials either as the polymer, the filler or the additive in an elastomer composite to enhance the performance of elastomer products. New design and simulation tools can help design more robust or effective products. Innovative and emerging technologies such as smart or electroactive elastomers can be adopted in new applications such as remote sensing, mechatronics or energy harvesting. Advanced manufacturing techniques can be used to make bespoke products more rapidly and with shorter lead times. Inspection tools can be used to validate product performance. New tools can help predict lifetimes for a range of different failure mechanisms including fracture, fatigue, abrasion and ageing. Products can be designed for second generation applications at the end of their lives. The conference enabled an exchange of ideas and new approaches in the design of components made using elastomers.